Over time, economists’ justifications for why free markets are a good thing have changed. In the first few classes, we saw how under some conditions, the competitive allocation maximizes the sum of agents’ utilities. When it was found that this property didn’t hold generally, the idea of Pareto efficiency was developed. This class reviews two proofs that equilibrium is Pareto efficient, looking at the arguments of economists Edgeworth and Arrow-Debreu. The lecture suggests that if a broadening of the economic model invalidated the sum of utilities justification of free markets, a further broadening might invalidate the Pareto efficiency justification of unregulated markets. Finally, Professor Geanakoplos discusses how Irving Fisher introduced two crucial ingredients of finance–time and assets–into the standard economic equilibrium model. Professor John Geanakoplos: So we have begun by talking about general equilibrium, and this was the background to the course so that you’re all familiar. Those of you who haven’t taken freshman economics or intermediate economics, what’s the background that’s required for the course? And the fact that general equilibrium is a part of finance is, as I say, a bit of an innovation because most finance courses are taught entirely independently of economic theory. But the two greatest Yale economists and two greatest Yale financial economists had finance and economics integrated, and I believe that’s the only right way of looking at the problem. And as I said at the very beginning, I think the events of the last few years have confirmed that view. So let’s take up the question today of why is the free market supposedly so good. So we worked out two examples last time, and the two examples are very similar to the first problem set that you did. In the first example you’ve got two agents A and B, and whenever we write agents A and B we really mean a million agents just like A and a million agents just like B. The heart of perfect competition in the economy is that there’s lots of people, and so we can’t–yeah, I think from now on hand them in at the end of class. So we mean a million people of type A and a million people type B. So the utility function of A, the welfare function of A is written there, and the welfare function of B is written and they each begin with endowments. So when these two million people come together they’re going to be doing the same thing that you saw in the class on the first day. They’re going to be haggling, and arguing, and the buyers are going to always say “the stuff’s not worth very much and why should they pay you so much,” and the sellers are going to say “it’s worth a tremendous amount and they should pay even more,” and eventually they’re going to come to prices. And we discovered last time that the way of describing what prices and what final allocations they come to is by writing down a system of equations, and you did that all in your homework and we came up with this outcome. So similarly we did another problem in the last class and we wrote down different welfare functions or utility functions and different endowments and again we got the equilibrium. So we said that one of the amazing things is that these system of equations, the six equations for each economy that you solved in class always have a solution. So the people who discovered that discovered it at the Cowles Foundation. They were Ken Arrow, Gerard Debreu who was a Yale assistant professor, Ken Arrow who was visiting the Cowles Foundation in Chicago but was a Stanford professor, and Lionel McKenzie who actually taught at Rochester. The economic equations always have a solution. So what’s so good about that economic solution? Adam Smith talked about the invisible hand, but there was no mathematics in Adam Smith. So why do we think equilibrium is such a good thing? After all, you saw in the example that there were three pairs of people who forlornly couldn’t trade at all. So clearly not everybody gets to trade, discrimination happens. Some people get the stuff. Other people don’t get the stuff. Well, the first approach of economists was that equilibrium maximizes the sum of utilities. So let’s see how that works in this example. So this example’s very special because everybody thinks that the good Y has constant marginal utility of 1. So that’s going to play a big role in our optimization in maximizing the sum of utility. So if you want to maximize the sum of utilities you have to maximize (100XA - ½XA squared) + (30XB - ½XB squared) + (YA + YB) such that XA + XB = 84 which is the sum of 4 and 80 and YA + YB = 6,000. So the claim is that if all these two million people meet in a room like this and start shouting at each other, and trading and offering deals and stuff, it’s going to come down to a final allocation which we’ve written over there were A gets 77 of the first good and B gets 7 of the first good, and that final allocation is going to maximize the sum of utilities. So why should that be the case? In fact in this example it is the case. Well why is it the case? Because there’s constant marginal utility of Y, so we don’t have to worry about the Y allocation at all because if you increase YA and decrease YB they still have to add up to 6,000. You’re going to be lowering A’s utility and raising B’s utility by the same amount so you won’t have changed the sum of utilities. So the Y’s are totally irrelevant to this maximizing the sum of utilities. So all we have to do is make sure that the X allocation, maximize the sum of utilities for the good X. So that you can see must be the case because we have to maximize the sum of two people’s utilities or two million utilities. You can always plug in XB as a function of XA, namely 84 [clarification: XB = 84 – XA]. So let’s write it as a function of XA, and we can replace this maximization by recognizing that XB is just a function of XA. In fact, it’s a very special function where the derivative of XB with respect to XA–so let’s call the function, we’ll call it that to denote that it’s a function–happens to equal -1. So we want to maximize this over XA taking into account that XB is just a function of XA, because to maximize you have to keep feasible. So we’ve now ignored all the constraints. Constraints have now disappeared provided we keep track of the fact that XB is a function of XA. So why is it the case that the equilibrium 77 and 7 maximizes this? Well, the key is diminishing marginal utility. We know that the utility function for–here’s X–utility function for A is quadratic so it looks something like that, and the utility function for B also looks something like that. And so if you look at this function entirely as a function of A it’s also going to look like that. So by diminishing marginal utility, the function, the sum of utilities is concave. Concave, remember, is a picture like that. So what is the essence of a picture like that? It means that setting derivative equal to zero implies you are at max. So that’s not true of any function. If you have a function like that and then it goes up like that you could have the derivative of zero here and not really be at the max, but because there’s diminishing marginal utility more and more of X does less and less good so it turns down. So all you have to do is figure out that the derivative is zero, which it is at this point, and then you know you’re at the maximum. But that at XA = 77 has to be the case because if you plug in XA = 77 and you take the derivative of all this with respect to XA of this whole thing, taking into account as before that XB is a function of XA, you just get (100 - XA) + now it’s just going to be (30 - XB) times the derivative of XB with respect to XA. Why is that? Because you know the chain rule, if I differentiate everything with respect to XA and XB is a function of XA it’s just 30 because I’m taking the derivative with respect to XB. So it’s 30 times the derivative of XB with respect to XA minus the derivative with respect to XB is XB times the derivative of XB with respect to XA, so it’s that. But if you plug in XA = 77 and XB = 7, DXB, DXA is -1 you just get 23 - 23 = 0, because the marginal utility of A is equal to the marginal utility of B at equilibrium. The sum of utilities is maximized, and that’s the end of the story. So that you noticed in the problem set, something like that. You may not have given exactly this argument. That’s what you were supposed to have sort of discovered in doing the problem set and now we’ve confirmed what you already pretty much knew. So are there any questions about that? It’s just the simple generalization of our football ticket example where the football tickets end up in the hands of the people who want them the most, and A happens to like a lot of tickets, not just one, and so A’s going to keep buying tickets until he’s bought 77 of them. And by then the next football ticket is worth less than 23 to him. B, she likes football tickets a little less. She’s not going to buy as many. By the time she gets down to 7 football tickets she’s going to think–so she hasn’t bought nearly as many. When she’s gotten to 7 football tickets she’s going to think the next one’s worth less than 23. And since the price is 23 they’re going to both stop there, but they’re each going to stop at the same point where the last ticket is worth the same to each of them, and all the previous football tickets each bought is worth more to each of them. So there’s no way of rearranging the tickets because if you did you’d have to take a football ticket that was worth more than 23 from one of them and give that ticket to the other one who by then would think it was worth less than 23. So that’s the argument. Okay. So economists were beside themselves with their brilliance in having proved this theorem and given a mathematical form to the invisible hand. Whenever you take a verbal argument like Adam Smith and turn it into a mathematical argument you’ve understood it better. You understand why it’s true and you also start to understand why in some circumstances it might not be true. So for 50 years, let’s say between 30 and 50 years this was the fundamental argument of economics and economic equilibrium that equilibrium was a good thing because it maximized the sum of utilities. But then little by little, starting with Irving Fisher and a bunch of people at the same time and a little bit later, so Hicks and Samuelson are famous for this, they began to wonder what kind of crazy utility functions are these where there’s some mysterious good that has constant marginal utility of 1. So in modern terms how could you justify it? You could say, “Well, maybe there’s a machine where we can calibrate exactly how happy people are and we can measure it. So for example, we can measure how aroused their skin is. The skin texture changes as you become less and more aroused. Maybe we could measure that. With MRIs we can measure brain waves. Maybe you can calibrate how many brain waves are spinning around and how happy somebody is, and maybe there’s some mysterious good like food that has constant marginal utility.” Well, that doesn’t seem very persuasive to me and it wasn’t to the economists of the beginning of the twentieth century. They all argued, starting with Irving Fisher, that it made no sense to think that we could actually measure utility, and more than that it made even less sense there’d be some good that had constant marginal utility of 1. So Fisher put everything on a symmetric footing and said, “Let’s think of the two goods, X and Y, as more or less symmetric. I mean, there’s no reason why one has to have some special role.” So let’s look at this equilibrium which we got the same way, and you did this on a problem set solving for equilibrium. Does this maximize the sum of utilities? Well, the answer is if it did maximize the sum of utilities at the final allocation we couldn’t gain anything by switching, reducing 9 fifths a little bit and increasing 6 fifths a little bit. But what is the sum of utilities? So if you write WA + WB it’s going to be for one thing (3 fourths log XA) + (2 thirds log XB). So let’s look at the marginal utility to XA–of good A. That’s 3 fourths, so marginal utility of A,X + marginal utility of B,X = 3 fourths times 1 over 9 fifths which is 5 ninths. That equals 15 over 36, which is 5 over 18 if I’ve done that right. It doesn’t sound right. Student: It’s 5 over 12. Professor John Geanakoplos: 5 over 12. Thank you. That sounds better. But let’s look at–so this is the margin utility of XA is 5 twelfths. What’s the marginal utility to B of X? Well, it equals 2 thirds times 1 over 6 fifths, which is 5 sixths, which is 10 over 18, which is 5 over 9. So these two numbers are different. The marginal utility to B is bigger than the margin utility–of X–is bigger than the margin utility to A of X. So clearly the final equilibrium allocation doesn’t maximize the sum of utilities. By switching some goods from A to B you could make both people better off [clarification: you could increase the sum of both peoples’ utilities, though one person would end up worse off in the process]. So that was a shock to economists. It meant that the argument they’d relied on, the thing which they were using to persuade policy people that the free markets were a good thing, is a false argument. It rests on a premise that’s indefensible, namely that there’s constant marginal utility and everybody can measure it. So they needed some other definition, some other way of capturing the mathematical idea that the invisible hand is a good thing. And the reason I’m spending so much time emphasizing this, even though you’ve seen this before, is because if economists made a mistake once what makes you think they haven’t made another mistake? So now let’s give the argument that in a weaker sense the invisible hand holds, that is that the free market comes to a very socially desirable equilibrium. And later in the course we’re going to find that that argument is also too narrow. So my point that I’m going to gradually get to is that economists have constantly taken too narrow and too special a view of the world, and as you enlarge the view of the world you have, not by making things mathematically simpler, actually you have to make them mathematically slightly more complicated, as you enlarge the view of the world you have you get closer to the truth and you start to find that the free market isn’t quite as wonderful as you thought at first and therefore there’s room for government regulation. So it’s not, as Paul Krugman argued, that economists are transfixed by mathematics and seduced into simple conclusions that the free market is perfect. On the contrary I would say they were afraid of too much mathematics, and by looking too narrowly they didn’t realize what they could have just by being mathematically more sophisticated. So it’s a failure of sophistication, not too much sophistication. So what did the economists argue? So the chief among them, Hicks, Samuelson, Pareto and Fisher, all these people basically came to the same conclusion. They said, “Well, it makes no sense to talk about the sum of utilities.” Let’s talk about Pareto Efficiency. So what’s the general problem? The general problem is you start with an economy made up of all these individuals. Let’s call them WAand WB, but it could be as many as we want so let’s just say Wi–and Ei, so Ei is the endowment of X and Ei of Y. So that’s the economy. You start from the economy and you go to equilibrium. And equilibrium is a price vector PX PY and allocations Xi, Yi, i in I, such that summation over all the i’s of Xi equals the summation for all the i’s of EiX. So i’s final consumption of X, plus j’s final consumption of X, plus everybody else’s final consumption of X, those are the sum of the Xi’s, is equal to the sum of everybody’s endowment. And similarly for the Y’s, [equals the sum] of EiY and such that everybody is doing what’s in their personal interest which is maximizing Wi of X, Y, so, the max of Wi of X, Y such that [(PX times X) + (PY times Y)] = [(PX times EiX) + (PY times EiY)] is solved by Xi, Yi for all i.
That’s the definition of equilibrium. Everybody individually optimizes looking at his own budget set, the hell with everybody else, does the best in his interest, chooses Xi, Yi at the going prices, supply equals demand, that’s how you get the final allocation. So that’s the definition of equilibrium and now we’re trying to argue that’s a good thing. So what’s our criterion? Well, what Pareto and Edgeworth and everybody else decided is, “Let’s look at the welfare functions WA and WB.” So if you take some allocation like the original allocation 2-1 and 1-2 you’ll have a welfare of each person, (3 fourths log 2) + (one quarter log 1) that’s the welfare of A, and the welfare of B will be (2 thirds log 1) + (1 third log 2), so that’ll be some point here. So this is welfare B, welfare A at initial endowment. And then if you look at the welfare at the final allocation, so, (3 fourths log 9 fifths) + (1 quarter log 3 halves) you know it’s going to be something like this. It’s got to be up here. It’s going to be better for both people. How do you know that? Because A had the choice of just buying his initial endowment–that’s always affordable and he chose not to do it. He chose to do something else and he was better off and the same with B, so clearly the equilibrium allocation is going to be better than the initial endowment. And so the Pareto criterion is that an allocation Xi-hat, Yi-hat, Pareto dominates an allocation–so this is for all I–Xi, let’s put the i’s on the top. If and only if everybody’s better off: Wi (Xi-hat, Yi-hat) is bigger than Wi(Xi, Yi). So we started with an allocation, the E allocation here, and then we moved to competitive equilibrium here and everybody was better off. So the equilibrium allocation Pareto dominates the initial allocation. But now the question is maybe there’s some other allocation besides the competitive equilibrium allocation that dominates the equilibrium allocation. So the theorem is that if P, (Xi Yi), i in I is an equilibrium for the economy E–remember we defined the economy E, I better put E here–then no allocation (Xi-hat, Yi-hat), i in I, Pareto dominates (Xi, Yi) if summation Xi–hat equals summation EiX and summation–got a little too tight here, sorry about this, Yi–hat equals, this is over i, equals summation EiY. So I can read this, it’s really bad. It’s a critical line right in the corner. So I’ll just say it in words and then read it literally. So this allocation dominates this one. The competitive equilibrium dominated the initial endowment, but maybe there’s some other way of rearranging the goods that gets you even further out here. The theorem says that’s impossible. So it says if you start with a competitive equilibrium, with an allocation (Xi, Yi) for the economy E, the no allocation like that one, no allocation (Xi-hat, Yi-hat) can Pareto dominate it. This couldn’t happen. You’d have to be down here somewhere. That couldn’t happen provided this other allocation used up the resources that were available. So the sum of the X’s in this allocation is the sum of the initial endowments, and the sum of the Y’s in this allocation is the sum of the initial endowments over the people. So of course if you add more goods to the economy you can make everybody better off, but using the existing goods in the economy, which is the sum of the EiX’s and the sum of the EiY’s, there’s no way to make everyone better off than at the competitive equilibrium. So it says literally if P (Xi, Yi) is an equilibrium for the economy E, which is that, which includes the initial endowments, the no allocation (Xi-hat, Yi-hat) Pareto dominates (XI, YI) if the sum over I of Xi–hat equals the sum over i of EiX, and if the sum of the Yi-hats over i equals the sum of the EiY’s. That’s the theorem. So we’ve totally weakened the definition of equilibrium. So it might be that if this is the competitive allocation if you look at this line this is same sum of utilities, because if this slope is -1 and here’s the utility to B and the utility to A everything on this line has the same utility. So that theorem would say anything else that’s feasible had to be down here. The sum is less than that. But here we’re not saying that. We’re no longer saying that. Maybe you can increase the sum. From this equilibrium you could increase the sum by taking something away from A and giving it to B. You could increase the sum. So that would have been here. You increase the sum, so you no longer have maximized the sum, but the fact is to make B better off you had to make A worse off and that’s the new criterion, Pareto Efficiency. So that’s the theorem and now we’re going to prove it so that you can see the whole logic of the free market just amounts to that. So are there any questions about this? You all supposedly saw this before, but that doesn’t mean you really did. So does anyone have a question what’s going on? This is a very basic incredibly important idea. All right, so I’ll give you one more chance. Somebody must have a question. Yes? Student: Could you just re-say the theorem a little bit more slowly? Professor John Geanakoplos: Yes. Why don’t I draw a picture, which is what I was going to do anyway? So let’s draw a picture, and I’ll bring the theorem back after having drawn the picture. So the picture is going to be due to Edgeworth. So he invented the indifference curve and he invented it in order to draw this picture. It was an incredibly clever picture. So he says, “Let’s look at this economy,” the one on the right that we start with. We put XA here and XB here and you notice that A begins with an endowment of (2,1). So let’s put his endowment (2,1) here. So this is EAX = 2 and this is EAY = 1, right? That makes sense. Now we can draw his indifference curves through that. So his indifference curves he likes X more than he likes Y, so the indifference curves are going to be sort of vertical. He doesn’t like to give up X very much, so his indifference curves are going to look sort of like this. And the most important indifferent curves are the ones where he gets better off than he was before. So now in the end there’s going to be a budget set which is X is way more expensive than Y, so there’s going to be a budget set that looked like this. That’s sort of the budget set that he faces. And he’s not going to choose this. It turns out he chooses something like here which is he chooses a little bit less of X, 9 fifths, and a little bit more of Y. So here’s XA = 9 fifths which is a little less than 2, and XB he chose was, I can’t read it, 3 halves which is more than 1. Are you with me? You asked the question. Does this picture make sense? Professor John Geanakoplos: So he obviously did better than he did before, but we’ve got another guy to worry about. So how can you put the second guy in the same diagram? Well, let’s just add the total endowment. Where’s the total endowment? Well, it’s 3 units of each. So here we’ve got 2. So this is 1, 2, this must be 3. So the total endowment of good X is 3, 2 + 1 is 3 and a good Y is 3 as well. Here’s 1, here’s 2, here’s 3. This is supposed to be a square. The aggregate endowment is here. This is the total endowment, 3 of each. What are the feasible allocations? So this is an extremely clever insight of Edgeworth’s. He said, “Look, the total endowment is (3, 3). If I tell you that A has got (2,1) (that’s this point) what’s left over, B must be consuming.” So B’s consuming the distance from here to here which is obviously (1,2). And if A ends up over here at 9 fifths, 3 halves, that’s from here to here is 9 fifths and 3 halves, since the total is (3, 3) B’s obviously consuming what’s left over, so he’s consuming this difference. So whatever A does you can see in the diagram looking at it the normal way, but if you just sort of twist your mind a little bit and look from this direction, once you know what A’s doing you can figure out what B’s doing, so each of these points defines a feasible allocation. And now what we want to say, the theorem says, look at the utilities that A and B got out of this allocation. A is on this indifference curve. You know what he’s doing. B you know is coming from here. We know how he’s doing. So look at the allocation they got. You can’t make both people better off than that by choosing some other point in this square. So let’s look at it from B’s point of view. From B’s point of view B likes more of everything. So if A gets less B’s going to get more. So from B’s point of view the further out you go this way the better it is for B. So the axes for B looks like that. So he’s going to have some indifference curve that–B’s indifference curve has to look like this. So here’s where B started here, and then B’s going to be better off doing like this. So B’s indifference curve looks something like that. Those are B’s indifference curves. So the further out you go this way the better off B is, so as you shrink what A gets, that obviously means B’s getting more, and so B’s getting happier and happier. So what is the definition of Pareto Efficiency? Whatever point we pick like this one to begin with: is there a way of making both people better off. Well the answer is the competitive equilibrium makes both people better off. Why is that? If you can see it from back there, the reason is that A went from this white indifference curve to a better indifference curve over here. B, whose budget line is the same budget line looked at from his point of view, he went from his indifference curve over here to one here. So he went from this yellow indifference curve to a better one, so both of them got better off going to this final allocation than they started with. And of course that had to be true because A could always have chosen to stay where he was at (2, 1). He moved to (9 fifths, 3 halves) because it was better, and B could have stayed where she was at (1, 2). She chose to go to (6 fifths, 3 halves) because it made her better off, so both of them must be better off at the final allocation than they were to begin with. What does the theorem say? The theorem says–remember, in pictures, it says whatever point we pick here that defines something for A and defines something for B, then we can look at the utility welfare functions of both and see what indifference curves they’re on. The theorem says there’s no other point in this whole diagram which puts both A and B on a higher indifference curve for each of them than they were at the competitive equilibrium. So if I read the definition again it says, if I start with an economy there with the endowments and the utility functions, so the endowments and the indifference curves, and I compute the competitive equilibrium like we did over there, then no allocation, that means no point in that box could make everybody better off than they were at the competitive equilibrium provided that new point is in the box. So it makes the sum of the X’s equal to the sum of the endowments, and the sum of the Y’s equal to the sum of the endowments of Y. This is the end of the proof. We already gave the proof according to Edgeworth. So what’s the proof according to Edgeworth? He says, “It’s all a matter of looking at it the right way.” It’s easy to look at the picture from A’s point of view. You just look at the X-axis and the Y-axis. This is the Y-axis. What is this? This is XAY. It was 3 halves. So this is the Y-axis going this way. This is the Y-axis and this is the X-axis going this way. For A it’s very simple to look at the Y-axis and the X-axis for A. A’s got its indifference curve getting better and better. So from A’s point of view it’s very simple, you look at the endowment, you draw the budget line through it, which is some linear line, and then A picks the best point on that budget set drawing the tangent, which is the white indifference curve to this point right here. That’s the best he can do. Now the trick is to see that from B’s point of view up here things look very similar because B’s endowment is also at this point. He’s got 1 unit up here of X and 2 units of Y. Why does he have that? Because the two together added up to 3, so if this is what A’s endowment was then of course what’s left over is B’s endowment. So B has to go here. Now what does the budget set look like for B? Well it’s also a linear thing with the same slope and it goes through this point. So from his point of view this pink line is also his budget set. It goes from here all the way down to where it hits his Y-axis down here. They’ve got the same budget set just looked at from opposite sides. Now what is competitive equilibrium and supply equals demand mean? It means that when A chooses this point as the best point, which happened to have been (9 fifths, 3 halves), then B is happy to choose what’s left over as his best point. So his optimal point, his indifference curve that’s tangent to his budget set has to be the same point looked at from his origin instead of A’s origin. That’s the trick. So that’s the key insight that Edgeworth had, his beautiful picture, and now the point is that if the white indifference curve looks like that, anything that makes A better off has to be on this side of the white indifference curve and the yellow indifference curve, which is B’s indifference curve, anything that makes her better off has to be on this side of the yellow curve, but the white curve goes that way and the yellow curve goes that way. So there’s no point that’s simultaneously above A’s indifference curve and also above B’s indifference curve. So therefore nothing could Pareto dominate it. So that’s the Edgeworth proof. Yes? Student: So no matter what our point’s going to be on our pink budget line because that’s <> down. That’s all the goods we have. Professor John Geanakoplos: Right. The pink budget line describes what you can afford to buy, describes the budget equation, this equation, so everyone’s going to choose on the pink line. This point is feasible. B gets almost nothing and A gets almost everything. B’s never going to let himself be forced down there because B can choose something on the pink line, so he’s always going to choose something better than that. So that’s proof number one. I’m just going to give proof number two. Most of you have seen this before, but I’m going to give another proof and then I’m going to see whether you really understand what all this means. So here’s a second proof. This is a much better proof. I’m going to write this algebraically. The proof of Arrow 1951 and Debreu 1951 separately, so this is called the Fundamental Theorem of Economics, First Welfare Theorem of Economics. So all this pictorial stuff makes so many assumptions, there are only two kinds of traders, there are only two goods. They are consuming only on the boundaries. I mean, they’re never consuming on the boundaries it’s always in this, you know, there are just so many special assumptions and everything is two by two. It’s just special case. So let’s give a much more general proof of this theorem. So here we’ve got–two goods won’t play any role. There could be any number of goods. There are two goods only here, but there are many traders, lots and lots of traders. So, what’s the proof that (Xi hat, Yi hat) couldn’t Pareto dominate it? So supposed that we’ve got–this is equal to summation Xi-hat, and this is equal to summation Yi-hat. So we’ve got another allocation which is feasible. So could it be that this other feasible allocations of Xi-hat’s and Yi-hats, could that make everybody better off? Could that make each i better off than (Xi, Yi)? And this proof is so short and so beautiful, so elegant, and so convincing that it’s mesmerized people now for over 50 years and it prevents them from seeing that there could be an even a more general situations where things aren’t so great. So what is the proof? It’s two lines. If (Xi-hat, Yi-hat) is really better for i, then I claim–line one, Wi of (Xi-hat, Yi-hat). Sorry, this is line zero. This is just repeating what’s the case. Wi of Xi-hat, Yi-hat greater than Wi(Xi, Yi). That’s for all i. That’s the claim. Could this happen that you’ve got a feasible (Xi-hat, Yi-hat) and it makes everybody better off than (Xi, Yi). Could this happen? The answer’s no. Line one is, if that were true then it would have to be the case that PX times Xi-hat + PY times Yi-hat had to be greater than PX times EiX + PY times EiY. Why is that? Because the budget set of Mr. i says he spends all his money on X and Y in his budget set and does the best he can. (Xi, Yi) solves this problem. So if this thing really makes him better off than what he chose, it can’t be that it was affordable–otherwise he would have bought this instead. So it has to be that for i, this bundle cost more than he can afford. That’s why he didn’t choose it. So this relies on agent rationality. Everybody given his choices, he doesn’t care about the rest of the world, but given his choice everybody’s doing the best thing he can. Shiller would say, “People make mistakes. They’re crazy. They have no idea what they’re doing. They’re stupid. Some guy tells them a story in the bar one night and they totally change their life around,” so he’d say all this isn’t true. All right, but anyway I actually believe that people have more sense about deciding for themselves what’s good for them than third parties do about deciding what’s good for them. So I don’t want to challenge this. So if you don’t challenge this you conclude that if something makes everybody better off each person must have found this allocation unaffordable otherwise he would have chosen it. [Audio dropped] over i of EiY. So all I did was–that’s true for every single person i. So I could add this inequality for i, plus this inequality for j, plus this inequality for all the people and then I use the distributive law to take the sum inside and I have this. But that is impossible and that’s the end of the proof because the sum of this Xi-hat is equal to this sum. That was what we had supposed. You’re just rearranging all the goods that are really there and this sum is the same as this sum. So therefore since the new allocation just rearranges the endowment differently from the equilibrium, and rearranges the X’s maybe differently from the equilibrium, it has to be that actually this thing on the left is equal to this thing on the right. It’s identical to it so it can’t be greater and that’s the contradiction. That’s the end of the proof. So it’s two lines, two lines to prove what Adam Smith spent 400 pages arguing that the free market is a good thing. So this is the basis for the idea that we shouldn’t regulate, we shouldn’t regulate, we shouldn’t regulate. Sounds pretty convincing, so any questions about this? Anything you’d like to say? Are you convinced by this? What are some reasons you don’t believe this, some obvious reasons? Yes? Student: Well, even if this proof makes sense a lot of regulation policies have to do with changing the prices of things anyway so we’re not necessarily <> with them at market <>. Professor John Geanakoplos: I’m glad you asked that question because it betrays a misunderstanding, so I’m glad you asked that question. So this theorem is correct given the assumptions. There’s a little bit mistake in the reasoning he made. I want to repeat his question, change it a little bit so maybe he’ll deny what this is what he was saying. But I believe what he just said is what really happens in a lot of regulation is they come in and they change the prices. They tax a good, they prevent people from trading so much so the price changes. They subsidize something. Something happens so that you get different prices, and of course at those different prices you get a different allocation. That’s all true so far. And then he said because they’re at different prices you can’t compare the original equilibrium allocation to the new equilibrium allocation. Well, that’s where he shortchanged this proof, this proof says however you get to a new allocation (Xi-hat, Yi-hat), maybe it’s because the government has intervened and changed all the prices and done a bunch of other stuff, but in the end after all that intervention the government is going to get you to a new allocation (Xi-hat, Yi-hat), and that new allocation can’t be better than the original one. So that’s the force of the argument. No matter what the government does in the end the upshot is a new allocation (Xi-hat, Yi-hat). We don’t have to think about [how] it got there. That’s where it got and according to this argument it can’t be better. So the argument is correct and elegant. There must be something missing to the argument, some assumption you don’t really believe if you doubt the argument. Yes? Student: What if you want an allocation that’s better for one party even at the expense of the other party? Professor John Geanakoplos: What if you want an allocation? Student: It’s socially desirable to have an allocation that’s better for one party even if that comes at the expense of another party. Professor John Geanakoplos: So one argument you could say is that it may be in the equilibrium that A–so who’s better off here? You notice that this equilibrium A ends up with more of everything than B does. So you could say this equilibrium is not very socially desirable because A ends up with more of everything than B does or at least as much of everything as B does, and that seems unjust and unfair and so we don’t like the allocation, and so maybe we should move something from A to B. So that’s an argument on the basis of justice. It says we can find juster allocations that are somehow socially more desirable, but this argument of Pareto Efficiency is about efficiency. Maybe you could hurt A to help B because that serves your desire for fairness, but that doesn’t say anything about how efficient the allocation is. It’s still true that the original allocation was efficient in the sense you couldn’t make anyone better off. So the economists would say in order to hurt A and help B what you should do is take some of A’s endowment away from him and give it to her and then let them trade to a new competitive equilibrium where she began with more than him. And so the just thing to do is to rearrange the resources at the beginning and still let people trade to a final allocation. So that’s an argument from fairness, but it doesn’t interfere, it doesn’t contradict the economic argument that fair or unfair it’s still efficient. We’ve done as well as we could making everyone as happy as we can. Maybe we can hurt someone and help someone else but we can’t help everyone at the same time, whereas most regulation the argument in favor of regulation is you’re helping everybody by regulating, and this says you can’t ever do that. So what’s missing? What’s some of the assumptions? This should be an elementary question for you. Yes? Student: Is it violating one of the three assumptions that <>, the market theory? Professor John Geanakoplos: No, it’s got all those assumptions so there’s something about the model that’s too narrow and this should be easy. You’re going to tell me obvious things where it’s too narrow, so I’m going to just say where we’re going. You’re supposed to be telling me now obvious ways this is too narrow. I’m going to say, “You’re right. You’re right. You’re right, but finance is different. We don’t have to worry about those problems supposedly.” So go ahead back there, you. Professor John Geanakoplos: So one critical shortcoming of this argument is that there are externalities. Suppose that X is cigarettes, and A buying and smoking more cigarettes makes B sick. So that’s not part of this. Why is that not part of this? Because B’s utility depends only on what B’s consuming, not what A’s doing. So there’s no place in this model. It’s too narrow to include externalities, so it doesn’t capture the fact that he, by smoking, might make her sick by smoking so many cigarettes and that’s not in here. And if you put the idea that B’s utility, her utility might depend on what he’s doing and not what she’s doing the theorem won’t be true. So there’s a reason to tax pollution, and to tax cigarettes and all those things because of externalities. So that’s a fundamental problem. Yes? Student: It’s also assuming that all of our indifference curves are aligned in the same shape. Professor John Geanakoplos: Well, we’re assuming diminishing marginal utility, but each person has a different indifference curve, so yes. We assume that they are all curved away from the origin, so we assume diminishing marginal utility. But I think that I’m almost prepared to believe, diminishing marginal utility. It’s not literally true. Moving from one ticket to two tickets may be a huge gain in utility because now you can bring your friend along. Getting one ticket might not be worth much because you don’t want to go alone. Getting the second one may add a huge amount of utility. That’s an increasing marginal utility, but eventually after you’ve got enough tickets it’s going to be diminishing marginal utility. So I believe on the whole that diminishing marginal utility is not such a bad assumption, but this clearly relies on that, so you’re right but I don’t think that’s the critical problem. What else is there? Yes? Professor John Geanakoplos: Credit markets, now we’re starting to talk a little bit about finance, so just hold that thought for one second. Anything else you can think of besides externalities that’s terrible for–so let me transition this way. So of course people notice externalities. Another kind of regulation is perfect competition. We assumed everyone took the prices as given. There was no monopolist setting the price and refusing to bargain with people and stuff like that. So regulation could come about in order to enforce the competitive equilibrium to allow for perfect competition, so we assumed that already. That’s one place for regulation, and a second place is because of these externalities. So for 50 to 100 years everybody has accepted those two arguments. Clearly there’s a place for regulating free markets, ensuring free markets and stopping trusts and monopolies, and for stopping externalities. But then people said finance is different. There aren’t any externalities. You’re just trading stocks and bonds. There’s no pollution. Nobody’s going to get sick because someone else has a stock or a bond. Some people might be jealous but we’re not really going to take that into account. We don’t want to honor those kinds of feelings of jealousy. So the argument seemed to be when you get to finance you don’t have to worry about externalities, and yes you have to worry about perfect competition but once you’ve got perfect competition that’s the end of the story. So the rest of the course now is going to be, if you forget about externalities because you forget about pollution because we’re trading pieces of paper, they’re not polluting anything, why shouldn’t the financial markets be efficient? Why doesn’t this argument apply to the financial markets, and one of the critical financial markets is the credit market. So can you understand the credit market on just these terms and therefore argue that the market’s efficient? So we’re going to spend a large part of the course talking about that. So unless you had some particular point to raise now, I’m going to just use your comment as a good introduction to the next part of the course. So far there’s nothing that seems to directly involve finance in what we’ve been talking about. So where does the finance come in? So Irving Fisher was the person who created the first really general equilibrium model of finance. So he was a Yale undergraduate. He was a superstar Yale undergraduate. He graduated first in his class from Yale. He was a math major. He decided that he wanted to build a financial equilibrium model. There were no economists there at his time. We’re talking, in the late 1800s, and so he went to Gibbs, the famous physicist, one of America’s most famous physicists at the time and said, “Can you advise an economics PhD?” And Gibbs said, “Well, if it’s mathematical enough, it has a model and something, yes I can do it.” And so Fisher’s PhD dissertation was basically reinventing this general equilibrium model that I’ve just described and then making a machine to calculate equilibrium with water and pumps and water seeking its own level and solving for equilibrium. And we had this machine up until the 1970s in the Cowles Foundation when it got stolen. Some engineer named Sreenivasan about ten years ago was ready to rebuild the machine–because we have the dissertation where it explains very carefully how Fisher built his machine, and he was going to rebuild it. And then he was offered ElBaradei’s job. ElBaradei is the guy, the nuclear inspector who goes to Iraq and says they’re building nuclear stuff or they’re not building this. Anyway, so he was offered that job, and so he left Yale and then decided not to take the job after all. So we’ve still got ElBaradei in the job. But anyway, he left Yale and so we never got the machine built. He was a great guy. Anyway, so Fisher after writing his dissertation stayed at Yale as an assistant professor and he got tenure. He became the most famous economist probably in the country for a while. He invented finance, as I’m about to tell you, and in a way this model of finance I’m about to present which was in retrospect clearly the most interesting model of finance of its time, and he was a financial economist. He also was an entrepreneur, so you’ll see later that he started his own company. It was a proto-computer company called Remington and he managed to make $10 million dollars for his company in the early 1900s. So anyway, Fisher, convinced that the economy was going to turn around, poured all his money into this computer company Remington. The company in the great stock market crash nearly went bankrupt and was leveraged. So he had to go to his wife who was very wealthy and borrow her money, and they lost that money. Then he went to her parents and borrowed all their money and lost that money. And finally he had lost everything of his money, his wife’s money and his wife’s parents’ money and they were about to take his house from him, foreclose on his house, and so Yale was forced to buy his house for him so he could continue to teach. So he set a bad precedent for economists at Yale because whenever any economist at Yale has financial advice to give, someone always quotes Irving Fisher’s 1929 line that the economy had reached a permanently high plateau. But anyway, despite all that his theories are well worth studying. He was famous for a few other things. Shiller is clearly trying to imitate Fisher. Fisher wrote a huge number of books, 50 books about everything. So he got tuberculosis and he survived and he wrote a series of books on good living and good health and how to combat tuberculosis. So he said you had to exercise, you had to get fresh air, and these were huge bestsellers. Then he said that drinking was a terrible thing. So he did an experiment in class where he would have his students do pushups, then he’d give them all a martini. Then he’d count how many pushups they could do. Then he’d give them a second martini and count how many pushups they could do. And he found that there was a 10% reduction for each martini. And so he said that prohibition–since the average business person had two drinks at lunch–that prohibition would increase output by 20%. And so he was one of the leading proponents of prohibition. So after the stock market crash he helped form the Cowles Foundation. So Cowles, who was a Yale undergraduate, had run a very famous macro forecasting company in the 1920s. And in 1929 the stock market crashed. There were a whole series of these. They sent newsletters. The same kind of stuff they do now. He, unlike all the others, after the fact realized that he hadn’t anticipated anything about the crash, much like nobody anticipated it now. And he was so embarrassed he went and collected, not only his old recommendations themselves, but all his competitors’ and so he published a famous paper in which he argued that economists had no idea what they were talking about, in fact that they were frauds. So nobody would go there so they had to move it to Chicago where the Tribune was and it was in Chicago from 1930 to 1955, and then in 1955 it moved to Yale. And since then the Cowles Foundation has been at Yale, and you’ll hear a lot more about it later. But anyway. So Cowles [correction: Fisher] with that background he set out to figure out how to turn economics–in fact he invented economics, this model of equilibrium to study finance, but so far we don’t have any finance in the model. So how can you put it in? Well, what is missing? What do I need to put in the model in order to turn it into finance? What would you say is missing? How would you turn this into finance? What other key thing–yes? Student: You need some element of time. Professor John Geanakoplos: So the first thing–of course you may have read ahead in the notes, but that’s a brilliant insight if it’s yours. You need time in the model. So far we just had apples and oranges or something being traded. So the first thing is Fisher said you need to put time in the model. What else is critically missing in this model, one other thing, the major other thing? Yeah? Professor John Geanakoplos: Well, that’s good. There’s risk. That’s missing entirely. So Fisher actually couldn’t figure out how to put that in the model, but we’re going to get to that. That’s very good. What else is missing? Yeah? Professor John Geanakoplos: Fisher, you’ll see, had something to say about time and impatience that people always care more about the present than the future. But what other fundamental thing about–what is finance all about? When you think about finance what do you think about? Student: Savings or credit rates. Professor John Geanakoplos: So you think about credit, as she said, credit, interest rates, and what else? Professor John Geanakoplos: Return, that’s quite related to that. So all this has to go in the model, but what fundamental object when you think–the first thing you think about finance what do you think of? Yes? Professor John Geanakoplos: Money, so that’s not what I had in mind, but I’m glad you think about money. He’s right. That is what most people think about, so money. So in this course we’re not going to provide a theory of money. So Fisher did provide this theory of money and that’s what he was talking to Roosevelt about all the time. We’re going to talk about inflation and stuff like that, but we’re not going to explain where the inflation comes from. So inflation is going to very important, but we’re not going to talk about a theory of money. So what else is missing, something really basic though? Yes? Professor John Geanakoplos: Loaning funds, well somebody said credit. That’s sort of loaning funds and interest rates. Professor John Geanakoplos: Collateral, that’s something. I’m going to add that. Thank you. What a brilliant idea. What basic thing? Come on. Yes? 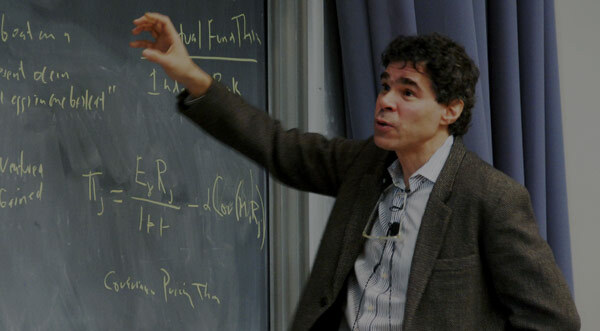 Professor John Geanakoplos: Wealth, that’s in the model. Where’s wealth? It’s already there. So when you take your endowment and you multiply it by the prices in your budget set that’s your wealth. So we’ve got wealth. Professor John Geanakoplos: Capital, so capital–and what is capital? What do you mean by capital? If it’s money, I already told you that’s not quite going to be there. Professor John Geanakoplos: Contract, so we’re getting there. Professor John Geanakoplos: Assets, so assets–that’s the main thing so I’m going to write it over here, assets. After all finance is a lot about the stock market, bond markets, mortgage markets. Those are all assets that you buy that pay dividends later. So assets are things that pay dividends at a later time. That’s the critical thing that’s missing. So he said, “Number one, time.” How do you put time in the model? Simply think of Y as the same good as X but one period later. So Fisher said, “Time isn’t such a big deal. We’ve already got two goods. These crazy marginalists before me they had good X, which was interesting, and this very boring good Y and so it’s not so clear how you can have time and everything in the model, but I’ve already got two interesting goods, X and Y.
They’re both entering with the same symmetric properties. Neither one of them seems more interesting or more important than the other one, so in fact maybe they’re the same good. It’s just–X and Y is the same good, it’s one comes one period later.” Now next class, we’re going to talk about you’re not going to value them the same amount. The utility for X and Y won’t be the same. So here A obviously thinks more of X than he does of Y, and by the way, B, she also thinks more of X than she does about Y. So why is that? Well, if Y is the same as X but a year later–people are impatient. So the reason why A might like X better than Y and B also is not because they’re different goods, but because they’re impatient. So we’re going to come to that later. So we can have the idea that they’re two different time periods in the economy simply by change of notation and not introducing anything new at all. Well, what about assets? So I’m going to come back to that in the next class. What about assets? How can you introduce assets in to the economy? Well, Fisher says, “What is the essence of an asset? The essence of an asset is that it’s something that you hold today because later it’s going to deliver you money or goods or something.” And we’re not going to talk about money so we’re imagining these are all real assets. So they’re going to deliver goods in the future. So the definition of an asset is an asset, remember, we have to make it mathematical, so Fisher started this society to make economics mathematical. So an asset is literally something that delivers goods in the future. So an asset is defined by its payoffs, DX and DY. So we can call that asset alpha, an asset alpha is defined by its payoffs, DX and DY. So it’s going to pay a certain amount of X and a certain amount of Y. That’s all there is. Now, we’re going to ask, do people actually know what the payoff of Y’s going to be? If Y’s in the future that means it hasn’t happened yet. Do we really know what Y’s going to be? And so maybe we know less about one asset and more about another asset, so maybe one asset is riskier than another asset. So someone said risk, obviously that’s going to be a very fundamental question. But before we come to risk, if we don’t have any risk yet, because Fisher didn’t know how to put it in and we’re going to start with his model where there’s no risk, then if there’s just today and tomorrow and everybody’s rational, everybody, since there’s no uncertainty, everybody wants to be able to anticipate exactly what the dividend’s going to be. So the asset is no different from what its dividend is going to be. Maybe it’s paying something today and also it’s going to pay something tomorrow, so assets are defined by their dividends, nothing more than that. So the model now becomes a model where we have the WI and then we have the goods as before, the endowments of the goods, but we’ve added a new thing which is we’ve added the assets D alpha X and D alpha Y. So the alpha’s over all the assets, and we have to add everybody’s ownership of the assets to begin with. So we have to have theta. I’m going to call it theta bar alpha, theta bar i alpha. So how much of asset alpha does i own? So that’s the economy that we’re going to start with. So we’ve made the model a bit more complicated. We started where we did before with utilities and endowments of goods. Now we’re adding assets which payoff more goods, and of course people begin owning trees and stuff like that. So a tree is an asset. It’s going to pay apples later on and various different people own various different trees. So to the old economy we add something new. And now Fisher’s ingenious insight was that if you think about this, which we will for a little while, you’ll be able to discover that you can simplify this economy back down to the economy we began with. So you can start talking about assets and interest and all kinds of others things using the same analysis as before. So with my last thought here, what does interest have to do with PX over PY? What is PX over PY? Suppose they’re both apples. So X is an apple today. Y is an apple next year. What is PX over PY? It says how much an apple is worth today relative to how much an apple is worth tomorrow. So this is going to turn out to be 1 + the real interest rate, Fisher would call it. Because if PX is more than PY, let’s say PX is 20% more than PY what it means is by giving up one apple today you can get 1.2 apples tomorrow. That’s just what happens when you put money in the bank. You give up something today you get exactly the same thing back next period but more of it. So you see just by having time and the prices like we had before you’re going to see very quickly how interest, assets, everything is going to start coming into play very quickly. So I didn’t put the problem set on the web yet because I wasn’t sure how far we’ll get, but I’ll put it on in a couple hours and we’ll start again on Thursday.